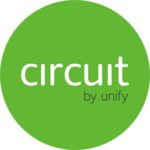 Circuit is an integrated digital workspace and communication software that promotes team collaboration. Its features include audio and video conferencing, screen sharing, chat or messaging, contact and content management, and more. We compiled Circuit user reviews from around the web and determined that it has generally positive ratings. We also shared its available pricing options. Users who gave Circuit a positive review said that the various communication tools included in the platform are effective in promoting collaboration among their team members. They also find the software easy to use and navigate. Users who gave Circuit a negative review said that they experience occasional glitches when using the screen sharing feature and sending direct messages. Some of them also recommended adding more web and API integrations for better and seamless business operations. A user who left a positive review of Circuit on G2 Crowd said that he finds it easy to use the software on both desktop and mobile devices. He also commended the excellent audio and video call quality even in wireless environments. According to him, the customer support team is not only quick to respond, but is also very competent. A user who left a negative review of Circuit on G2 Crowd complained about glitches when using the share screen feature, saying that it could get time-consuming to fix. He also mentioned instances when he didn’t receive notifications for new direct messages, causing delays or confusion among the team. Circuit has a free option and three paid subscription plans: Team (€3.95/month), Professional (€6.95/month), and Enterprise (€14.95/month). The main differences between plans are the data storage capacity and the availability of advanced features such as recording and telephony connector. Check out the list below of some of Circuit’s features. Best Messaging App for Business in 2017 – Slack vs. Hipchat vs. Skype — We looked at the most popular messaging apps that help team members communicate and collaborate. Read on for our comparison and review of the top three options. 8 Best Free Project Management Software & Tools — In this article, we looked at the most popular free project management software options that help users organize their business’ resources, assign and monitor tasks, centralize assets, and consolidate communications. 26 Helpful Time Management Tips and Techniques — Managing your business’ productivity is synonymous to effective time management. In this article, we shared expert advice on management techniques, tips, and tools that every small business can adopt to improve their bottom line. Does Circuit offer a free trial or demo? Yes. Interested users can sign up for a 14-day free trial with an allocation for 100 users (three users per conference call) and 1 GB storage capacity. What makes Circuit different from other communication tools? Circuit is an all-in-one digital workspace in the cloud that allows users to communicate and collaborate virtually using a single platform. Circuit’s high-quality voice and video make online meetings appear as natural as possible. It can also be easily customized through extensions and a growing range of APIs. This video provides a tutorial on how to use Circuit’s features and navigate its interface. Not sure if Circuit is the right fit for you? Read our reviews of all top project management software or check out one of these three Circuit alternatives.